From just 6 digits up to 64 digits with digit sizes from 6" to 15"
The design brief was to fit the scoreboard into the window space in the umpire's changing room. The ground at Alberbury CC is located just inside the Welsh border with England on the other side of the river which borders the eastern edge of the ground. 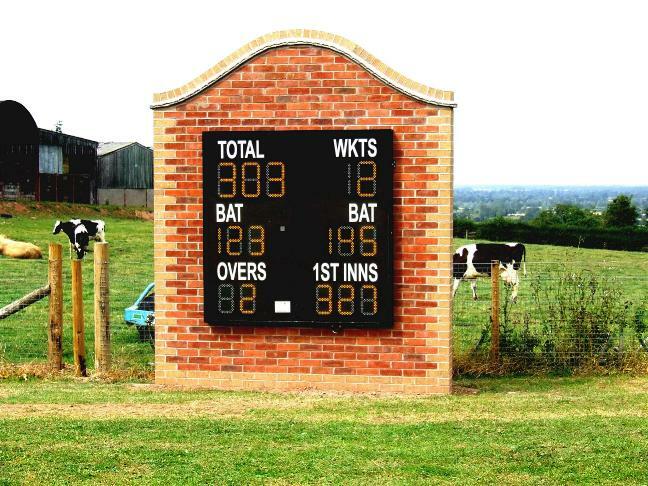 The scoreboard is mounted on a brick and stone wall which was built by one of the members. Many clubs have admired this simple design for its clean look and the view of the cows in the next field. The 3 sticks are not the wickets but a style between the fields. Data and power are connected by wires via an underground duct between the pavillion and the scoreboard. Lightcliffe CC are one of the top clubs in the Bradford League. 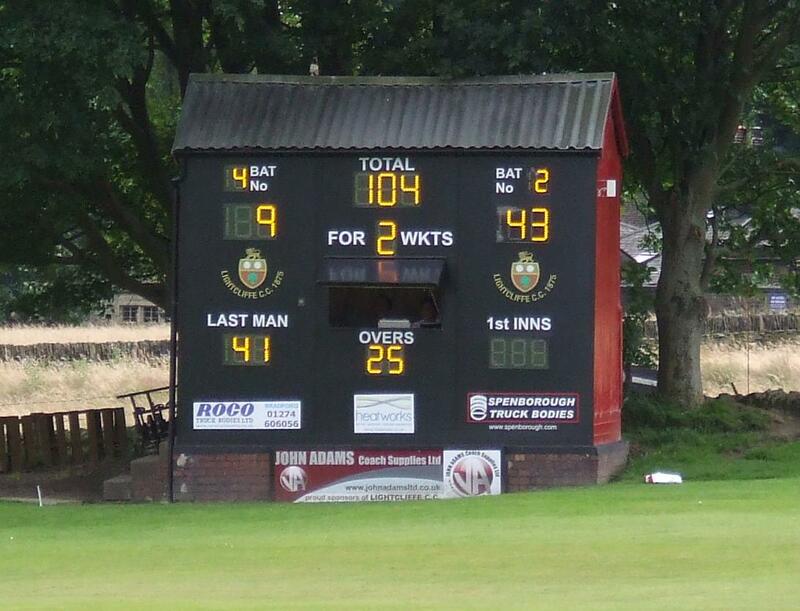 In July 2012 the club decided that their ancient scoreboard was only fit for the Industrial Museum and decided to invest in a state of the art electronic scoreboard from Bespoke Scoreboards. The club members replaced the fascia and took the opportunity to repair the scorebox and paint the outside. The system has a wireless controller which can be either used from the pavillion or inside the scorebox. The digits are mounted on a back board with polycarbonate windows. A legacy enabled St. Edwards School to buy a new scoreboard to replace the old wheeled wooden hut. 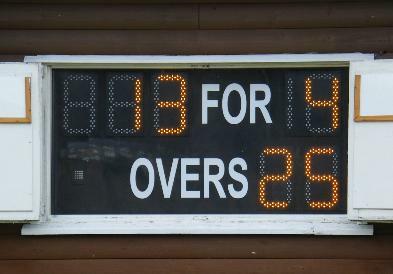 The design required a scoreboard which looked like a giant TV screen with a traditional layout for the digits. The scoreboard was made with black anodised aluminium for the housing and mounted on a plinth which looked like a TV stand. Mains power is supplied from a cabinet in the grounds of the playing field with the 12v DC power pack inside the scoreboard. The system is wireless with the control panel located in the old pavillion on the far side of the ground. 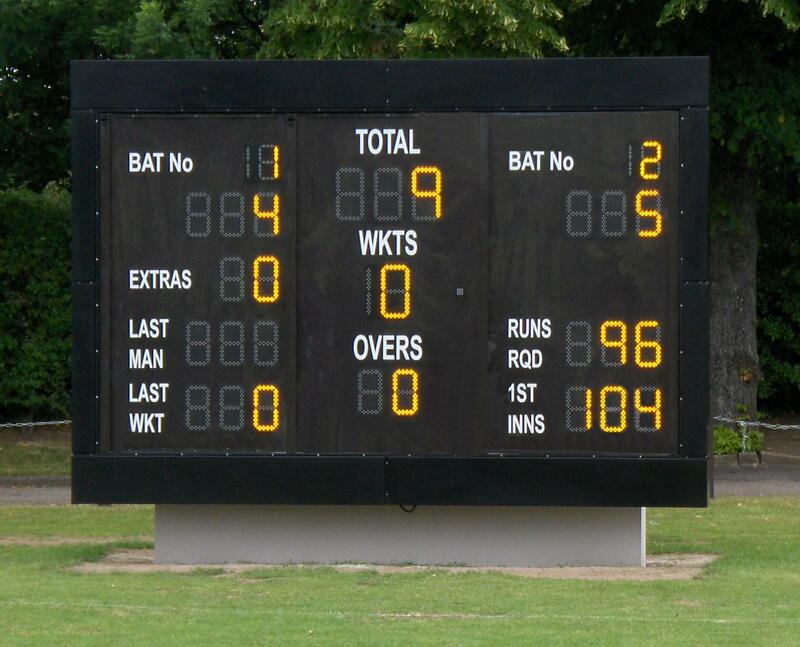 A Bespoke Scoreboard will enhance your club's image and make the game exciting for both the players and spectators.